Bharti Singh’s Writer Hubby Haarsh Limbachiyaa Debuts As ‘Dialogue Writer’ For The Film! However, amidst all this chaos, this film marks a well-known television personality’s entry into the B-Town space. And we are talking about comedienne Bharti Singh’s writer hubby Haarsh Limbachiyaa here. 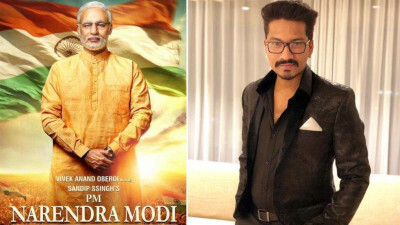 And before you start wracking your brains on what will Haarsh be playing, he is debuting as the dialogue writer with the Modi biopic. Haarsh has written for television comedy shows like Comedy Circus, Comedy Classes and Comedy Nights Bachao. And an elated Haarsh shared the news with his fans and followers on social media. The film will go on floors in mid-January. Reportedly, the film will be shot across Gujarat, Delhi, Himachal Pradesh, and Uttarakhand, among other locations in the country, over a period of a few months. "I am extremely fortunate. Today, I am feeling like I felt 16 years ago, during ’Company’ days. I am feeling the same kind of excitement and hunger because this is the role of a lifetime for any actor. I truly believe at the end of the journey, I pray I become a better actor and a better human being," Vivek revealed.